Can Your Dog Donate Blood? The jugular vein, a large vein on the neck, is used to draw blood for blood donations. Just like people, dogs can be blood donors to dogs in need. There are usually certain requirements that a donor dog must meet in order to give blood but it is usually a very simple collection process. A better understanding of dog blood donations may help you decide whether or not your dog can be a donor and help other dogs. There are several different dog blood types, or groups, that can be tested for and they are ordered numerically in the dog erythrocyte antigen (DEA) system. These blood types include DEA 1.1, 1.2, 1.3, 3, 4, 5, and 7. Several other types also exist, but there are no tests for them. Dogs can have multiple different blood types at one time since the types of blood refer to the different antigens the blood contains. In order to determine what type of blood your dog has, it must be tested to see what antigens it contains. Your veterinarian will take a blood sample from your dog and run a test to get results. Not every veterinarian is able to perform these tests in-house though so the samples may need to be sent to an external laboratory. The tests will check to see which antigens are present on the red blood cells which will determine the blood type of your dog. Just like people, some dogs lose large amounts of blood due to disease, surgery, or trauma and therefore require a blood transfusion. Blood transfusions are not performed by every veterinarian so specialty or emergency hospitals may be utilized for this procedure. The first transfusion a dog receives can be with any type of blood but if subsequent transfusions are needed the blood will need to be typed and crossmatched. Crossmatching blood ensures that the blood types are compatible between the donor and the recipient. When Can a Dog Donate Blood? Most veterinarians have specific requirements to ensure blood donors are of a certain size and healthy enough to handle giving blood. Fifty pounds is usually the minimum weight required for a dog to be a blood donor. They must also be friendly; free of infectious, blood-borne diseases and parasites, such as heartworms and Lyme disease; be up to date on vaccinations; not be on any medications other than the typical parasite preventatives; and be between one and seven years of age. Dogs can only donate blood once every three weeks so if your dog is requested to give blood more frequently it should not do so, for its own safety. How Does a Dog Donate Blood? Giving blood is a very simple process. If your dog meets the physical, age, and temperament requirements to be a blood donor, it will need to be tested for blood-borne diseases and receive any vaccinations necessary in order to be current. Once the blood-borne disease tests have been determined to be negative, your dog can give blood. The blood is drawn from the large vein in your dog's neck, called the jugular, and collected into a special bag or jar to be used to transfuse another dog. The entire donation procedure typically takes less than an hour. Usually a dog gives blood as needed, so you and your blood donor may be on-call for emergency donations at your local animal hospital that performs blood transfusions. 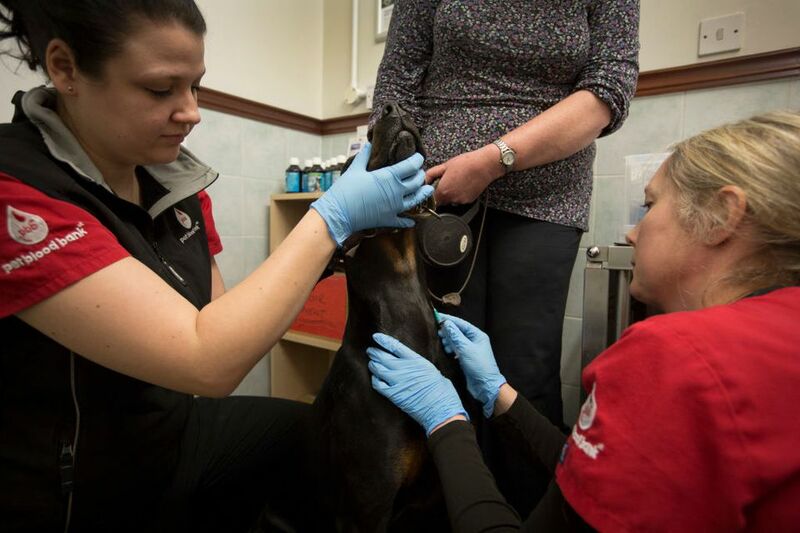 Each hospital that utilizes dog blood will have their own program requirements and may even reward the donors with credits on their veterinary hospital account. The other option is to donate blood to a dog blood bank. A few non-profit blood banks exist in the country that sells blood to veterinarians. These blood banks are especially important for dogs who need more than one transfusion. Since the first blood transfusion can utilize any blood type but subsequent transfusions require crossmatching or a universal donor, it is important to know what type of blood a donor dog has and have different types available for these dogs. Blood banks will type the blood they receive in order to know whether or not the blood has the universal donor type, DEA 4, or other specific antigens that some dogs may or may not be able to receive. In addition to whole blood, packed red blood cells, different forms of plasma, and cryo-precipitate may be collected to be used. Unlike whole blood, these products can usually be stored for longer periods of time to be used at a later date. If a dog does not need whole blood, a donor is not available, or specific clotting factors are needed, veterinarians may be able to utilize plasma, packed red blood cells, or cryo-precipitate. Can Dogs Get High on Marijuana?